A few days ago I asked for help/hints about rigging already existing models I only have as obj file to my M4 and V4 characters. The clothing model has been exported from a game called Skyrim (the Game is open for modders, that's why you can export them). One Pose, not even an extreme one, the mesh broke around the entire Torso/Shoulder area and I could see ugly gaps which I couldn't fix without messing up the weight painting. To keep it short. I give up on that :-/ and will try to use the model as reference so I can create my own that looks just like it - but will fit V4 and M4. What do I have at my disposal? 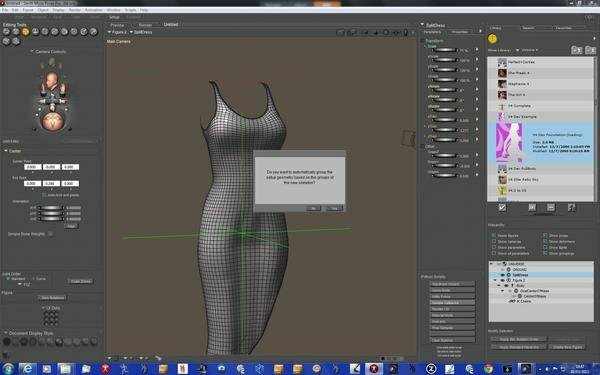 Advanced Carrara 8 Tutorial from Daz3d Shop. - I never gave the cloth modelling part any thought, since most things I wanted could be bought. Now there is no way around it. 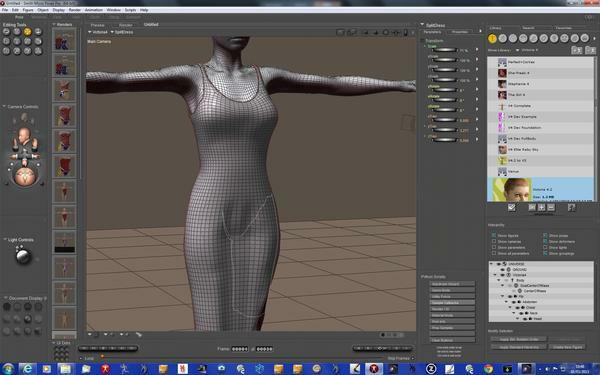 I want to be able to create cloth figures not "props" in Carrara and rig them in Carrara (if possible) to V4 and M4. Since I work purely in Carrara, it doesn't matter that the clothes become Carrara only. I do not like to work in Poser & DS... even if it could be easier for rigging. Can I create good quality clothes with morphs or at least that will move and pose with my character in Carrara? I do not expect to create the same detail and quality as Artists like Aery Soul.. (not to mention that they are a "team" and not a one man show like me). I know I should start with faaar easier things - though, I found I learn best when I practice on the object of my desire. 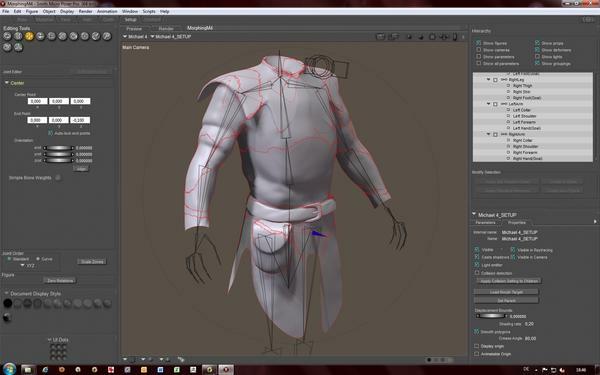 As I said, I never gave the cloth modelling part of the Tutorial any thoughts. Does anyone know if that one is suffiecient for my needs? My advice, which is probably not what you want to hear, is to give up on conforming clothing. I hate it. It's a nice idea, but in practice it is extremely difficult to get really good looking conforming clothing. Yeah, some rare exceptions, and yeah, it's probably good enough for hobbyist work, but for me it's such a pain with all the morphs and junk it's just not worth it. And nine times out of 10 you can tell it's conforming clothing and, IMO, it just looks lame. Which is why I was hoping for a decent cloth sim in Carrara, which apparently ain't gonna happen in our lifetimes. I so agree with you on the comforming Vs. dynamic cloth. I have my hissy fits with some clothes often enough and Daz3D not implementing it in Carrara doesn't make it any better. :-( so far I tried to cover up the stiff mess comforming cloes produce by using Photoshop tricks. Well, maybe I can make use of bullet physics, since I never will render animated videos. I am more into the still image thing. Though Buying another tool, no matter how good it is, is no option for me due lack of budget and already having more than enough 3D/2D applications on my computer. So I have to make it work with what I got or maybe still find a way to get an already existing mesh properly fit to my character. Can't be done in carrara. Carrara's rigging is not compatible with poser figures. You'll have to rig it in Studio. Note: carrara's bullet physics wont do anything about poke through. There is modeling in the assembly to tug clothes out of the figure, but good luck with that. If the clothes have been through autofit, or have no morphs it wont work. The thing with bullet/soft body is it works on all clothes, and quite nicely some times. Just make sure you have no poke through and use the softbody pining to keep hard items from dropping off, or clothes to stay on a certain area; like the waist on pants and dresses. Because the morphed characters I am using are Carrara only now and also use some of the Xameva "Perfect" fixes which I imported with Fenric's tool. So I probably have to do the same with the cloth. From Poser content I know that the geometry file is always an Obj file. Is it the same in Daz Studio? Then another question. The model I crafted is a bit thin. Does it make sense to add a tad thickness to it, if I am going to rig it, anyway? Most models I have seen are usually thicker than just one layer of poly. Edit: It rigs for Genesis, not gen 4 I guess. For poser-type clothes adding thickness to the entire garment can result in bad things--the inner surface poking thru the outer surface, for example--so most clothes makers make a bit of thickness at the edge of the garment to give it a more real feel. If you have DS 4.5 and you want to conform it to Genesis, there's a youtube video by bobbie25 that shows you how, and it's not hard. For conforming to other figures it can get a little more complicated - Lady Littlefox has a good series of tutes in her store at RDNA about modeling and rigging clothes for poser & DS, that might help. Thank you both for the heads up on the tools. I think I will check out Lady LittleFox's tutorials, since my current figures I am working with are V4 and M4. I put so much time and careful effort in morphing my characters in Carrara - I am not really in the mood to work with Genesis seriously. I'll wait with that until Carrara 8.5 will be released and the Genesis stuff in there works. You may not want to hear it, but you can weight paint in a posed position and along the time line. I haven't done rigging in studio 4, but I have in carrara. In fact carrara was the first app I ever managed to bone/rig anything; I had tried a few other apps before but could never manage it. I modeled/boned/rigged a shirt and pants for M3 in poser 6, Wont do it again. And if you do this stuff all the time, for a living, my hat is off to you, you are better person then I. Actually, rigging in Poser Pro 2012 is very straight forward these days. I'ts pretty much a one click process if you have a decent donor rig. Of course I take the resulting CR2 into Studio to refine it and load in the FBMs. That also has the effect of making the CR2 Carrara friendly and makes adding morphs in Carrara very easy. You may be past this stage now, but the mesh breaking when posed is often due to parts of the mesh being unwelded. That's often a problem with exported game meshes. I have Poser 2012 Pro at home, though I only use it for runtime-database and dynamic cloth on my dragon membranes, and sometimes preparing certain morphs one can't add in Carrara. I checked Lady Little Fox at runtimedna, surely a great Tutorial though a bit expensive for me right now since I probably won't be creating clothes that often, nor selling them. Is there a way to rig obj. files to M4 / V4 in Poser 2012 without that whole weight mapping transfer? Also when I follow this tiny walkthrough, will morphs from M4 be transferred to the cloth, too? Or is adding morphs to a piece of cloth an extra step? I noticed that some seams broke... welding didn't really help though ^^ it just made the model look weird. This will be a bit rushed for the moment, I've got to get ready for work. I'll post some more in a few hours. I'm using a mesh that I've modelled as a dynamic item so it's not ideal but should give an idea of how things work. It will also show one pitfall that I'll show how to avoid later. 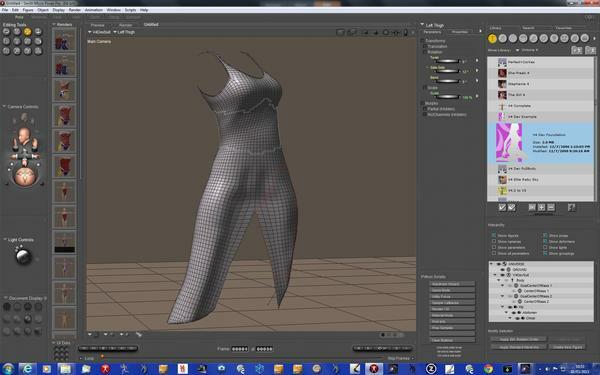 First you need to load up your V4 base figure in Poser and zero it. Then import your modelled mesh and fit it to that base figure by scaling and translating. Now, optional, delete the base figure to simplify things. I'd save at this point as well in case things go wrong later. Click on the setup tab and confirm the warnings. In your Victoria4 character folder there should be a V4 Dev Foundation figure. Double click on thatand confirm that you would like to auto group. Go back to the pose room and test the rig. And that's pretty much it at a very basic level. Save to the library as a new figure. 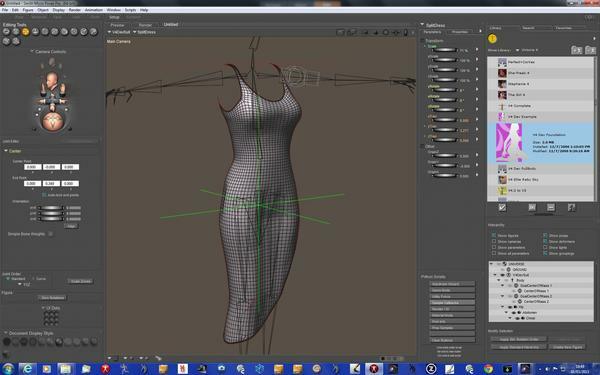 You can see the problem here of using a bipedal rig when rigging a dress. We also have a lot of unnecessary bones that can be deleted. If it's for your own use only, you can use any figure (clothing item) that you own as a donor rig. The ideal ones to use are those that most closely match your model but if you want to add your own morphs you will need to strip out any pre-existing morphs and clean up the resulting CR2. It gets easier over time as you gradually build your own stripped down donor rigs for all sorts of items. Got to go now. Later. I got so far that I went to the setup - and it warned me. Then I was in there - but...I don't have any of the M4 or V4 Dev Foundation Figures. Can't even remember that I ever had them (not even by option). But that's what I get when I pose it :-/ either too few polys or... not enough welding. I tried welding all the critical spots in the grouping tool. Just looking at the sleeve on the first image. I've seen that sort of distortion when a small amount to the area has been weight mapped incorrectly. It may be worth looking at how the weight mapping is distributed in DS. The full M4 rig isn't a good one to use as a donor, the Bodysuit is better but still has a lot of morphs to deal with. The splitting of your mesh looks very odd on the shoulders and should not happen due to the rigging. It may be that you're importing it unwelded. Always import the mesh fully welded. PM me if you would like me to take a look at your mesh. To get the tails to work, look for a donor that already has that rigging. If you can't find one, I have a part completed project that I can adapt for you. Fundamental rule to avoid splitting: Each group should follow on from the previous group in the bone hierarchy. So in the case of the tails you need a tails group which comes entirely from the hip and then two groups for the left and right tails which both derive from that top tails group. The bones should match those groups. No part of the left or right tails group should come into contact with the hip group. It also seems that one cuff has missed entirely. Hmm I actually didn't use weight mapping at all (at least not knowingly). I went by the box-modelling Tutorial 3D Age suggested. A donor rig can have morphs already contained within it but that doesn't mean you will get any usable morphs transferred over to your figure. In fact you would be better off stripping them all out and putting them all in from scratch again. Now onto the issues with your rigging. The old Poser rigging does not use weight maps. It uses something that has a similar effect though. Each bone has 'zones of influence' associated with them that can be modified to match the mesh it is rigged to. These zones act like a weight map, with a linear progression of influence from the 100% zone to the 0% zone. Each rig for each clothing item will have customized zones. The zones on the base M4 rig are very tight and don't extend much outside of his skin, so when you use that as a donor they miss a significant part of your mesh which is very loose. You can see it when you bend the arm and some polys are left behind because they are actually outside of the bone influence. The auto grouping is pretty close to how I'd manually group, just a few minor changes that could just as reasonably be left alone. If you can find a really baggy Item that you could use as a donor I think it would work fine. If not, I've put a basic working rig together but it needs some refining. I believe you're going to re-do your mesh anyway? If so you can make things work better under the arms by modelling as close to the skin as possible in that area. You Fricken' R O C K ! ! ! I can only agree on that! Thank you so much RoguePilot. I will use the mesh you worked on as "example" and rebuild it from scratch. I still have some "Practical Poser 7 Book" in my old-book box - but most of that I couldn't really use in Poser 2012 and most of the time it was about CR2 editing. A clothing figure is identical in construction to a figure figure (if that makes sense). Try conforming an M4 to another M4 sometime and you'll see how that works. For clothing to conform to its intended figure properly the joint centers need to match which is why a donated skeleton is a good idea. I'm pretty tired from work these days (in a good way) so It may not be until the weekend but I'll put a tutorial together on how to make a base CR2 from a pre-existing one and then on how to edit joint falloffs. I have the Poser 7 book too. Some of it is redundant for Pro 2012 because you have tools in there that simplify things. The Poser manuals should be somewhere in your Poser directory as pdf files and are pretty useful. This whole modelling and rigging is a totally new territory for me, so I hope I am not too annoying with my questions. Some Rigging Tutorials I went through so far never appeared to be written for complete newbies like me. So some steps put my attempts on ice. Sometimes I find the way myself, but some stuff like the CR2 editing for example is totally new and unknown to me. I noticed that in Carrara V4 Poses and Expressions can be used by M4 and vis versa (probably old knowledge, but I until last week I didn't know) - this means that the "joints" and their location should be more or less the same? I am asking, because I have some V4 clothes that have also "tails". Mostly skirts with several tails - but some of those tails can be posed seperated from the entire model. Can I use in such a case those morphs from a V4 clothing model? Or would that create weird effects? V4 skirts tend to have long tails - while my shirt is not supposed to go past the knees. If it is possible, how do I extract those morphs - via CR2 editing copy paste? I also thought about using the Tail Morphs from M4 Evilson - but those are not really flexible and only for the front of the skirt. Would it make sense to chase my Shirt through the Cloth room, and having it snuggle against M4's body - then turning the "clothified" Shirt back into a prop, so it keeps it's shape... and then comforming it/turning it into a "figure"? From the instance list hierarchy, you can drag a part or a whole skeleton to the Browser, name it, then drag it back. This creates a duplicate skeleton, including any animation keyframes, poses, constraints(etc.). 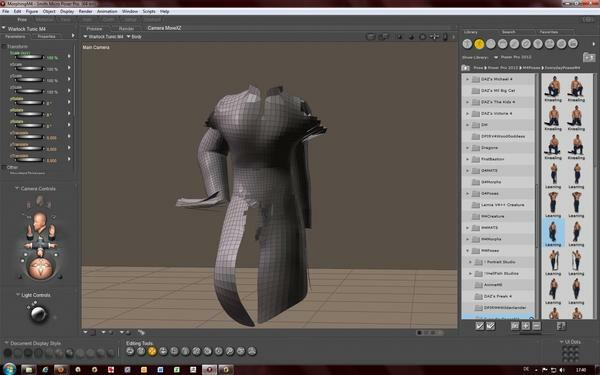 Then align and attach a mesh to the new duplicate skeleton. Weight paint if needed. Aligned with the original figures skeleton, it should follow any the original keyframes or pose keyframes on a basic but workable level(no conforming). I only tested this with a simple object and animation. Hope this helps. I have an Clothing Mesh as Obj. Usually, to turn it into conforming cloth I go now to the Setup Tab and pick a Donor for morphs and bones. The bones are there, the clothing becomes conformed - so far... morph dials are there but don't work at all. That's what I did so far, and where I am stuck right now. In Carrara, you can use a partial or whole skeleton(or rig) that is saved to the browser, and attach it to any imported objects. For instance. You can import a shirt object(.obj etc.). Then attach it to a saved skeleton, 'Animation->Attach Skeleton'(sometimes called Skinning). Carrara automatically sets up a default weight map for attached objects, but this almost always needs adjusting to better move/fit with the figure. 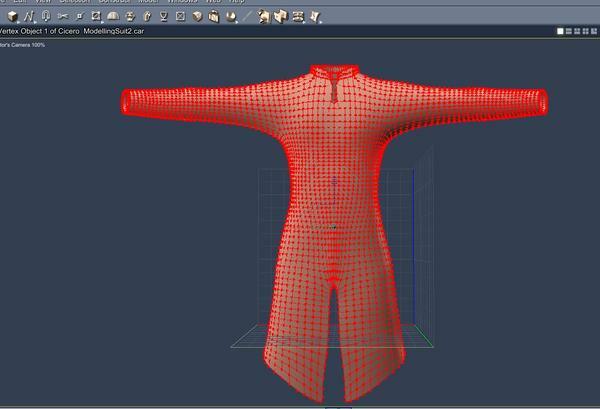 A V4 or Poser skeleton can also be saved and used this way for creating clothing. However, for personal use only, as you can't distribute Poser skeletons(EULA, afaik). Carrara also can not create Poser formats, so only other programs that support native Carrara rigging/skeletons would be able to read the setups. I can give more setup/info if you need. I've been doing some digging to find out where I got the V4 dev rig from. DIM came to the rescue here. In DIM it's called the 'Victoria 4.2 Morphs++ Developer Kit'. there's a direct download link to a blank M4 CR2 file under the resources tab. It doesn't come included in the Morphs++ pack for some reason. They may be better than the DAZ ones due to being simplified. I'll try those out now to see how easy they are to use. Just to point out, if you use a donor rig that has morphs in it; the morph names and dials will transfer over but not the actual morphs. This may cause confusion when adding your own morphs until the references are stripped out. The cheapest way to insert morphs is to use the DS4.5 'transfer active morphs' option on a conformed clothing item and then save the clothes out as a new CR2. You don't really need to learn the interface for this, it's a straight 'load up, do the job, get out' process. Another way is to use an external program like XDresser or MorphingClothes. All three do a quick, 'adequate' job, but, for morphs that matter, the best quality option is to model the morphs by hand. Wonderful :) Got now the Dev Kit and the M4 Blank. Thank you RoguePilot. So, I guess I have to download the DS Morph Packs as well, if I use DazStudio for the transfer. Don't you already have the morph packs? They'll work in DS anyway, after all, that's where the EXP injection files for them were made. If your working with ++ dials in Carrara, then you're already set up for Studio. If you don't have the morph ++ packs, they've just gone into the March Madness sale today. A good time to buy. I recommend the muscle morphs too.